Sir Simon Rattle - Recommendations? 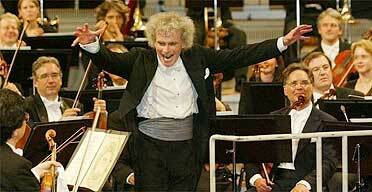 Topic: Sir Simon Rattle - Recommendations? Re: Sir Simon Rattle - Recommendations? I don't see Chailly leaving Leipzig in the near future and he doesn't seem like the type to enjoy jetting back and forth to NY every month or so. I didn't say NY. I think he could be interested in Philly or Chicago. I wouldn't bet on his attachment to Leipzig or his aversion to travel either. The NYPO needs to find a young lion who can be assistant director for a few years, learn the ropes, and then take over the orchestra. My crystal ball shows Andrea Marcon heading for NY. I mentioned her name on the old board as a possible successor and M Forever promptly responded with one of his scathing remarks about how I know nothing about the music industry (true BTW). But I DO think someone young is needed in NY. I wonder if they can get someone like Andrew Litton. He is homegrown, has had a good career and is just waiting for a big gig I think. Have you heard Zhang? How is she? I unfortunately moved away from NY before she started appearing more regularly, so I didn't get a chance to hear her. To be accurate, Andrea Marcon was just in NYC at Zankel Hall. He may be coming through again on his return to Italy, or may have already departed these shores. He leads the Venice Baroque Orchestra with Giuliano Carmignola, conducting while standing and playing the harpsichord. I think this is an example of Don's humor; I can't imagine that he thinks the NYPO strings are trading their steel for gut anytime in the near future. hehe. Only once, and it was a warhorse program (with a Beethoven symphony - but for the life of me I don't recall which one !) so the orchestra was most likely playing on auto-pilot. In any case it was very good. Now I am just speaking in purely musical terms. Some will say there is no way she can deal with the NYPO trustees and what-not but you can say that about any young conductor you put in there: you have no way of knowing whether they will flourish or wilt. Plus if you give them a chance it is not like they are going to make millions like Maazel or possibly Chailly. If you don't like them you can always cut them loose. Fieldston and Juillliard should have molded him into a very liberal NYer. If he returns, he can host all the Hilary or Barack fundraisers à la Bernstein. Actually, he has a great feel for Mahler, and could do a lot to restore the standing of the orchestra as a Mahler band. He just conducted the Juilliard SO last month at Avery Fisher Hall, but I haven't seen anything about that in the papers. Another homegrown boy who gets mentioned for the job is Alan Gilbert, whose parents were string players in the NYPO. The other names mentioned are Ludovic Morlot (French) as well as Chailly (Italian) both of whom impressed the orchestra when they conducted recently according to a story in the Times. He leads the Venice Baroque Orchestra with Giuliano Carmignola, conducting while standing and playing the harpsichord. That harpsichord must have very long legs! It's propped up on a dais. None of the musicians sit in that group, and they were the best dressed ensemble I've ever seen. the women wore Italian designer dresses (I think Armani and Missoni) and men wore very natty suits with beautiful silk ties. Oh, and Carmignola was dressed-down, but so beautifully tailored. I should also mention that his shoes appeared to be custom made. Extremely elegant, and the music wasn't half bad either. Actually, having the harpsichord propped up made it considerably easier for Marcon to lead than it was for Rchard Egarr who sits at the harpsichord, moving his head to the left, to the right, up, down, and jerking spasmodically for emphasis. I have to say the view is extremely distracting. (I guess no one ever told him that he shouldn't lead with his head. ) He reminded me of one of those bobble head dolls on the dashboard of a NY taxi. Since we're on the subject of fashion...I noticed Sir Simon always wears a dove gray tie and cummerbund with his tails for concerts. Unique. Looks very nice I think, matches his hair. Has he always worn that? My mom was over here and I showed her his BPO New Year's video. She's fairly musical but classical is really not her favorite, so we watched the Gershwin stuff. She thought he was great (and his Gershwin really is), and immediately said, "Oh, he's cute..."
When I saw him conduct, he wore all black. Are you sure he was wearing a tailcoat? Cummerbunds are not worn with tailcoats, they are used with dinner jackets (tuxedos). Yes, indeed, probably why I noticed it. Gray cummerbund only, white tie. Screen cap from BPO 03' New Years iattached. And also in the Gramophone featuring his CBSO M8, a pic of their performance. He's no Beau Brummel! A cummerbund with a tailcoat just isn't done; it looks sloppy. The traditional white waistcoat keeps the shirt looking very neat, especially if you have to wave your arms around. In the lower picture, the cummerbund hangs out under the coat breaking the lean line of the trousers. That cummerbund with a dinner jacket and a silvery pocket square would be very nice, indeed. He also should get a decent haircut. He could be quite a fine looking man if he got a good stylist. Perhaps we should call Trinny and Susannah to smarten him up. Right, I wasn't being serious, although I personally would think it a fine idea for the NYPO strings to take the gut route. I am surprised that O Mensch never heard of Marcon; he must not be a HIP fan. I'd love to see all the strings go back to gut. I wouldn't mind a few portamenti along the way along with a lot less vibrato. Then we could all watch David Hurwitz implode as he realized that once again he had fired the hurwitzer in the wrong direction.